There are so many events throughout the world that make people question the existence of God, but there is one in recent British history that would have had even the most religious person having doubts. The utterly horrific, arbitrary and pointless slaughter of 16 innocent children between the ages of 5 and 6 at their primary school in Dunblane, Scotland in March 1996 at the hands of deranged gunman Thomas Watt Hamilton, made many people question a world where mad people could get access to guns. In the event of horrors like this we all cast around for something to explain it, as if such a thing would soften the tragedy. But if there’s one thing that makes it even harder for people to come to terms with events like Dunblane, its the fact that there’s no explanation for it. This can leave people with the feeling that these kinds of tragedy can occur at any time, that there’s nothing really to protect us from the horrible depths that some people can sink to. Religious faith can be helpful at times like this but it’s still very vague on explanations. Astrology, however, can give us some pointers. The use of symbolic links can help us to see how and to some degree why these events happened. Many people would balk at the use of astrology to try and understand things like the Dunblane massacre. Capricorn Research is not deterred by these feelings, however. If astrology works and is to be a useful tool in comprehending life, then it has to be relevant in all areas of life, not just as a piece of new age positive thinking fluff thats parroted to help people with their self esteem issues. Astrology is beyond all these things, there is nothing in the human experience that cannot be described by the subject. It contains all things, light and dark, from the most enlightening of spiritual aspirations to the most degrading and horrifying depths that man can sink to. And since humanity does need to process and come to terms with even its greatest horrors, Capricorn Research is prepared to offer the charts that might help. The first one to look at should be the event itself. 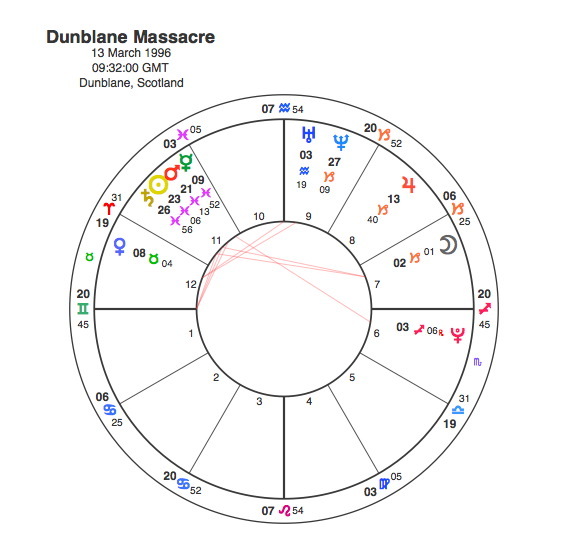 The Sun in the Dunblane chart is fenced in by a very difficult Mars / Saturn conjunction at the end of Pisces. There is something about the sign Pisces that gives a suggestion of innocence, but also of sacrifice. Saturn rules endings and Mars can rule violence, so this conjunction does seem to be suggesting a violent act that brings about the end of innocence. Saturn is also in square aspect to the Moon in Capricorn, a placing known for a lack of feeling and an emotional harshness and suppression. The fact that the Moon is applying to the 8th house of death may also be an indication of the tragedy. It is a chart with difficult features but it doesn’t stand out as symbolic of one of the deadliest criminal acts involving firearms in the history of the United Kingdom. The man who committed these awful acts was Thomas Hamilton. His exact motives remain unknown, though it is a matter of record that there were complaints to police regarding his suspicious behaviour towards the young boys who attended the youth clubs that he ran. There were suspicions prior to the massacre that Hamilton’s interest in boys was paedophilic, with more than one complaint being made regarding him having taken photographs of semi-naked boys without the parents’ consent. Hamilton’s childhood was not a normal one. Shame, deception and, possibly, hatred were the dominant emotions in his family. His grandparents pretended to be his parents and his mother pretended to be his sister. His mother, Agnes, was born the illegitimate daughter of a widow, Rachel Hamilton. To prevent a scandal, she was given away to a childless couple who were relatives. James and Catherine Hamilton looked after Agnes until she was 19 when she married a bus driver and their son Thomas was born. Eighteen months later, the father ran off with another woman and a second “scandal” was hushed up. Agnes went back to her adoptive parents, who adopted Thomas as their child. When Hamilton was 22, two things happened that possibly created the grievance that festered inside him for the rest of his life. He found out that the person he believed to be his sister was actually his mother and he was dismissed from the local Scouts group on the grounds that he was not suitable to be a troup leader. He set up his independent boys’ athletics clubs in school gyms, the boys whom he ordered to strip and run around in swimming trunks laughed at him behind his back and called him Mr. Creepy. Convinced from that moment that people were seeing him as a pervert, Hamilton fought a running battle with officialdom to deny the rumours that were constantly circulating about him. Hamilton may have been obsessed with real or imagined enemies and this may have been the driving force behind his murderous acts. But then if we start to look at the chart of the perpetrator we may get a clearer insight. Hamilton has the Sun in Taurus and the Moon in Scorpio. In Capricorn Research’s collection of the charts of 545 Murderers, the most common Sun sign by over 10 percentage points is Taurus with 124 %. The most common Moon sign is Scorpio with 128 %. The combination of Sun Taurus / Moon Scorpio occurs 7 times in this sample with an expected number of 4. It is true that as well as the Sun, Hamilton has a Venus / Jupiter conjunction in Taurus. This is not exactly what astrologers would expect from the chart of a mass murderer but perhaps it should be. The Venus / Jupiter conjunction is by far the most common aspect in the charts of the 545 Murderers occurring at 155 % of the expected number of times. As well as the Moon, Hamilton has Mars in Scorpio. But the most important thing is that the Sun and Moon are part of an extremely powerful and nasty T Square. The Sun, Venus, Jupiter and Mercury are in the 11th house of clubs and associations, a perfect placing for someone running youth clubs. The dark and intensely brooding Moon and Mars in Scorpio are in the 5th house of children. The Sun and Moon are in opposition as Hamilton was born on a full moon. The Sun naturally rules the daytime conscious side of the self, the Moon the nightime subconscious side. Whenever the Sun and Moon are in opposition there is a polarising of these two aspects of the self. But of all the possible full Moon combinations the Sun Taurus / Moon Scorpio is the most powerful and most intense. It seems that the very strength and stability that Taurus is known for can become extremely volatile when faced with the opposition to the deep and powerful raging emotions of the Scorpio Moon. All of the stories around the transformations of werewolves during the full Moon seem to evoke the symbolism of Taurus / Scorpio more than any other combination. But the one planet that would really focus all this into an explosive and violent act of unconscious hatred would be Pluto. Pluto is the apex of a T square from the Sun / Moon opposition. Capricorn Research believes this Sun Taurus / Moon Scorpio / Pluto T Square to be the most dangerous and difficult astrological pattern there is. An explosion of powerful unconscious emotion is inevitable with this configuration. It is exacerbated by the extremely close opposition between Venus in Taurus and Mars in Scorpio. There is a strong likelihood of violent expression of anger. Mercury is also in the 11th house in Aries opposite Neptune in the 5th perhaps showing an over idealistic view of how children’s ( 5th ) sporting ( Mercury in Aries ) clubs ( 11th ) should be and also a reflection of how the boys themselves viewed Hamilton as ” Mr Creepy “. These three powerful oppositions from the 11th to the 5th house shows the focus of Hamilton’s life and the fact that the hidden emotions of the Moon and Mars in Scorpio were in the 5th house shows that it would all come to a head focusing on children. 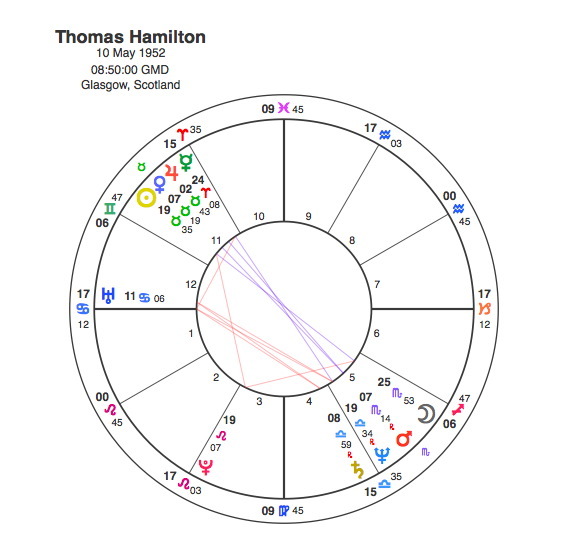 The other significant aspect in Hamilton’s chart is between his Ascendant / Uranus conjunction in Cancer in square to both Saturn and Neptune in the 4th and 5th house respectively. Again there is a connection with children through Cancer and the 4th and 5th houses. We also have the propensity for sudden unpredictable action as indicated by Uranus conjunct the Ascendant. All these pointers show the kind of chart that could result in its subject walking into a school and gunning down 16 innocent children. In fact the only strange thing about the Dunblane shootings with reference to Thomas Hamilton’s chart is the timing. On that fateful day in March 1996 there were very few major transits operating to his chart. The only transit that could be seen as particularly difficult at the time would be Neptune’s square to Mercury. Given that these two are in opposition natally it could be said that this was the time in Hamilton’s life when he completely lost touch with his reason. He could easily have been operating in a hallucinogenic fashion under this transit but on its own you wouldn’t think it would be responsible for such carnage. In fact if Capricorn Research had been asked to predict when the violence in Hamilton’s chart would come to fruition it would have been between 1990 and 1994 as Pluto made its only transit of his life to the T Square, opposite his Sun, conjunct his Moon and square its natal position. Another factor that should be taken into account is that between 1989 and 90, Saturn, Uranus and Neptune all renewed their natal relationship as part of a conjunction in Capricorn. During this time these three heavyweights all opposed the natal Ascendant / Uranus and squared the natal Saturn / Neptune. So these two patterns converge on the year 1990. Why therefore did Dunblane not happen 6 years earlier ? There is another question of course which is why did Hamilton choose that particular class at the Dunblane primary school for mass extermination ? Sadly, tragically these two questions are tied together because every one of the 16 children killed were born between January 1990 and January 1991. Capricorn Research does have charts of 15 of the children but does not wish to publish them. It is enough to say that some of them had very difficult planetary configurations, and many had particular connections to Hamilton’s chart. But they were all murdered as a class of school children not as individuals. And every single one of them had Pluto between 15 and 20 degrees Scorpio, right in the middle of Thomas Hamilton’s vicious T Square. All of their Plutos were opposite Hamilton’s Sun and square his own Pluto. As well as this every one had Saturn, Uranus and Neptune in Capricorn opposite Hamilton’s Uranus / Ascendant conjunction and square to his Saturn and Neptune. So that class of 5 and 6 year olds were tragically linked to Thomas Hamilton’s karma from the moment of their birth. It was just that Neptune’s square to Hamilton’s Mercury triggered the final eclipse of whatever tenuous hold on sanity that he had with horrendous consequences. These beautiful and innocent children had their lives taken away from them suddenly, violently before they had really even got started. But for many left behind in the village of Dunblane their suffering was even worse. The mother of Emily Morton one of the children killed was also a medic at the local hospital and she had to deal with the tragedy of her daughter’s murder at the same time that she was trying to help the injured survivors. Kathryn Morton’s chart has tragedy written through it. Kathryn Morton has the Sun in Scorpio in the 6th house of health, very appropriately for a physician. Unfortunately her Sun is conjunct Saturn and square to Pluto. The Sun / Saturn conjunction is also the apex of a T square that includes her Midheaven and Pluto. Pluto is at the very base of her chart in the 4th house of family showing how her whole life was blown apart that day. She also has another T Square based on an opposition between the Moon and Uranus. The Moon of course rules motherhood and oppositions to Uranus usually point to sudden disruptive changes. This opposition focuses onto Neptune in the 5th house. Neptune when in difficult aspect can indicate unexplained loss. It is in the 5th house of children. It is also conjunct Mars, so her beautiful daughter was taken away from her by an act of pointless violence. Kathryn Morton’s synastry with Hamilton is powerful and stark. Her Sun / Saturn conjunction sits astride his Scorpio Moon. Her Mercury is exactly opposite Hamilton’s Sun and square his Pluto. There is one more chart that is linked to this tragedy, one of a survivor who went on to achieve something truly great in his life, the first male Wimbledon champion for over 70 years. We don’t have a time for Murray, but as is often the case the noon chart works well. Andy Murray was in the same school on the day of the massacre, he was three years older than the children who were murdered and he spent the morning in a neighbouring classroom with all the others hiding under a desk. Such an experience at 9 years old would certainly leave its mark and we can see the impact on his childhood by the position of Pluto right at the very base of the chart in the 4th house of family together with a powerful Moon / Saturn / Uranus conjunction in the 5th house of childhood. Murray’s Sun is conjunct Hamilton’s Sun and his Pluto is conjunct the murderer’s Mars. Why was Andy Murray not killed ? Astrologically it was because his Pluto at 8 degrees Scorpio was not in Hamilton’s T Square. Also his Saturn, Uranus and Neptune were placed between 19 Sagittarius and 7 Capricorn, out of reach of Hamilton’s Saturn, Uranus, Neptune, Ascendant configuration. Murray was the wrong age in a different class at the school. Andy Murray has his powerful 5th house conjunction of the Moon / Saturn / Uranus opposite his Mars. This shows us the extent to which he has been able to use the experience to enhance his sporting achievements. Pluto is also exactly opposite his Midheaven so he has been able to use the trauma to forge his way in his career. Muuray has always nobly resisted any analysis that might suggest a link between the Dunblane experience and his extraordinary sporting achievements. Looking at his chart, however would suggest otherwise and that it has been a fuel for him. Whatever doesn’t kill you makes you grow stronger as they say. The other positive that has come from the Dunblane experience is the legislation that was introduced over the following year or two to ban handguns throughout Britain and the consequent tightening of school security systems. In this respect, Britain is at least 20 years ahead of the US. America has experienced its own tragic versions of Dunblane but any attempt at gun control has met with powerful opposition from people who believe it is their constitutional right to bear arms. To the vast majority of Brits this is an appalling idea and symptomatic of what we feel is wrong with the US. If the Americans are so desperate to keep their right to bear arms the very least they should do is hand over their birth charts for scrutiny in order to get their licence. Astrology can show links that help us comprehend the human experience, but ultimately it still can’t really explain events like Dunblane. In the end it is only the religious view that can make sense of it. The idea that all these innocents have gone to heaven. At least we know that the children who died that day wouldn’t have had to knock.